Amazing 3 bedrooms and 3 bathrooms villa,with sea view.3 Minutes Drive To Gaios and beaches.Please email,for discounted rates. The villa is stone build,in traditional way. Outside, you have 2500 square meters of private garden, BBQ, a stone built sofa/bed with pillows under a pergkola with shade by the pool, a second shade area with garden furniture and an outside shower next to the mosaic infinity pool. No matter the angle, the view is astonishing. Inside, there are 3 air-conditioned bedrooms and 3 bathrooms, a full equiped open plan kitchen with a dining area and living room area.The decoration is artistic and there are hand made pieces of art. The mattresses, the linen, pillows and the towels are hypo-allergenic and high quality. The huge shade balcony with curtains offers a fantastic view of the port of Gaios and of the Ionian sea, which will give you the serenity you were looking for..
**We are the owners direct,not a managers,not a tourist officies.We offer you a wonderful villa at the best value for money and find for you boat timetables,taxis,car rentals,boat rentals and give you our best recommends about restaurants,bars,beaches and all the best you can enjoy at Paxos with out commissions for as..
Greetings! We are the owners,Vasia and Andreas, a couple with 7 year-old twins. Vasia is an art teacher with many exhibitions in Athens, Santorini Island, London and Vienna. She is responsible for the artistic decoration of the villa. Inside the villa, you will find a handful of her own oil paintings, carvings and mosaics... Andreas works with property rents, occupies with the booking department of the villa and customer service. Both want our guests to be huppy and have a fantastic moments at the villa. The land is property of Andreas' family, for many generations now, and it has always been a personal dream to build a house at this wonderful place. With the great help and art of my wife, Vasia, this big dream is now reality and it seems even more like a dream.. The Red Rose Villa is located in one of the best places of the Island, just a few minutes away from Gaios, but in a calm and private enviroment. From your balcony or while swimming in the pool, you can survey the entry of the Gaios port village, with the fishing boats and the luxury yachts. The back yard has a safety door in order to keep your kids away from the pool, if you wish to. All 3 bathrooms have a shower cabin. The two of those are ensuites. Also, all bathrooms provide high-quality, hypo-allergic towels, free hand soap, shampoo, shower-gel samples and hair-dryers. Private,inside the yard. Remote controled. The living room area has a sofa/bed and a lounge chair. A satellite 42'' smart TV, a DVD player, a USB movie player, a mini USB stereo and WiFi inside and outside the villa. Big coffee maker, with capsules, which make wonderfull filter and esspresso coffee. Water, orange squash, bread, jam, honey, coffee, tea, sugar, milk, pasta, tomato sauce for pasta, oregano, wine, breadsticks, olives, pasteli (local delicacy with honey and sesame). There are 3 different dining areas, one inside, a second one at the huge balcony, with the fantastic view, and the third one next to the pool. Huge balcony with breathtaking sea view. We will help you get the best deal. There is a tennis court 7 minutes away by car. Notes on accommodation: Please contact as,to find out,about a better rates we can offer you Utility Room: There is a covered washing machine at the yard. Cleaning / Towels / Linen / Maid service: General cleaning 6 times per week and linens changed 3 times per week. Beautiful Villa, with fabulous views. We had a wonderful week in this Villa, which is in a perfect position just above Gaios, with fabulous views over the harbour. Very individual decor, which made it much more homely than some villas. The owners wife is a painter, and there were lots of her paintings on the walls. Very comfortable beds, and a cleaner daily, who kept everything spotless. The pool area was very nice, with a lovely infinity pool. Plenty of sun beds and two shaded seating areas. Andreas the owner couldn't have been more helpful, and responded to any queries immediately. He also arranged car hire for us, which was a great help. You definitely need a car in Paxos, not just to get around the island, but to and from the villa. Although it's only a few minutes drive from Gaios, it's up a very steep track, and would be quite a challenge to walk back up, especially at night! A perfect holiday - couldn't have wished for more! Thank you very much Jackie for your wonderful words.It is a great pleasure for as to have happy and great guests as you..I wish we will welcome you again..
A beautiful villa with so many individual and artistic touches. Fantastic view from the villa covered sittingitting areas and the lovely infinity pool. Great welcome from Andreas with a welcome basket of goodies. Maid service. Brilliant villa for a relaxing in comfort. perfect villa. its just WOW when you see it. when you first enter the gates of villa you cant stop WOWing for 1 hr. after this you cant stop discovering how perfect it is. there is everything you need, startinf from towels ending with grill. its perfect place to stay. host is the best person. he helped us to get to Paxos 2 times now (in 2016 and 2017) we stayed there for 1 week and it was the best experience we have ever had during our trip to greece. Sandro you are the best guest too.I really wish to have guests like you..My kisses at all the party..And to Georgia ofcourse.. The villa was absolutely beautiful with tasteful and quality furnishings. Very comfortable beds. The patio area is spacious and well furnished. The views are amazing- worth waking early to watch the run rise from the patio. Great pool area and again furnished well with lots of sunbathing and sheltered areas as well as places to sit, relax and enjoy the view and tranquility. Very peaceful and perfect place for relaxation. Easy walk into Gaios so no problem to reach bars and restaurants but walk home is up a steep hill- we enjoyed the walk home each evening though! Highly recommend and can't wait to return- one of the nicest villas I have stayed in. Owner extremely helpful and cleaning service excellent. Lovely villas in an excellent location - nearly perfect! We had a great time staying in Paxos at Andreas luxury villa's. 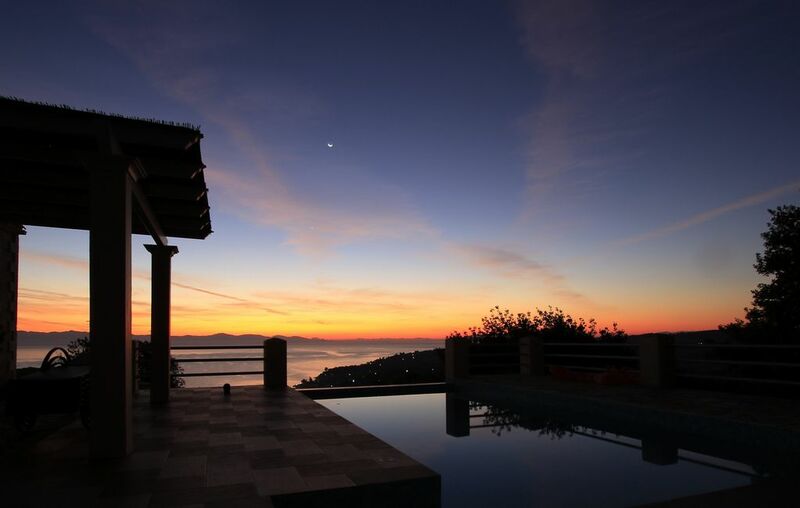 The view from the villa's and the balcony is amazing, looking over the sea and out across Paxos island! Andreas was very helpful and provided lots of information about the villas and the island before we arrive!! Very nice house, with lovely view to Gaios. The property is very well equiped. It was clean, and well maintained. Driving to Gaios is less tha 5 minutes. Plenty of choices for restaurants, cafes and bars. Overall Paxos is a great holiday destination. Quiet and relaxing! The nearest beach is 600 meters away,17 minutes by foot and 4 minutes by car. The nearest airport is at Corfu island, 30 miles distance. Car hire is recommended.The distance to Gaios is only a 12 minute walk, but the way back is uphill. Gaios is about 450 meters away. We always give our guests a welcome basket with Greek wine and local delicacies. We recommend the best restaurants, bars, beaches and the places you shouldn't miss. Booking Notes: We ask 25% deposit for the booking,another 25% one month before the arrive an the less 50% at Paxos after the arrive. Changeover Day: The change over day is Monday exact the low season time which there is flexibility.